Massive stars at the end of their lives do not go quietly into the night. Instead, stars many times more massive than our own sun can explode in a fiery supernova, spewing their guts across the cosmos. In fact, all the heavy elements that exist—the carbon in your bones, the metal in your computer—were forged in the core of a star and spread across the universe by a supernova. 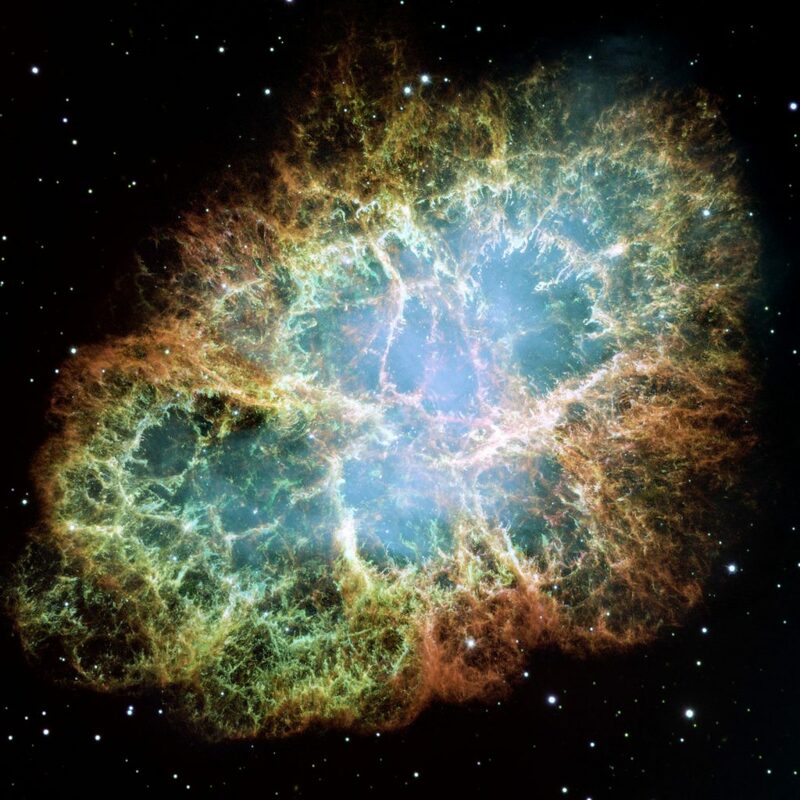 An enormous amount of a supernova’s energy, a whopping 99 percent, is carried away by a burst of neutrinos (of all flavors) in a span of about 10 seconds. The core of the collapsing star is incredibly dense, but because neutrinos interact so rarely, they escape from the center even more quickly than the light does. Neutrino observatories will thus be the first places on Earth to see a supernova and can be used to direct optical telescopes to the right part of the sky to witness the arrival of the supernova’s light. Many neutrino detectors are connected through the Supernova Early Warning System, or SNEWS, which will trigger experiments to record and save additional data if a sudden influx of neutrinos (indicating a supernova) arrives. It’s expected that a supernova will occur in a galaxy like the Milky Way once every 10 to 50 years. Scientists caught neutrinos from a supernova in a nearby galaxy, the Large Magellanic Cloud, in 1987 but haven’t seen one since. With a number of large neutrino detectors now up and running (and more planned for the coming decade), researchers hope to gather significantly more data the next time a supernova goes off. It’s predicted that a supernova in our galaxy could result in 5,000 to 8,000 neutrino events in a single detector. In comparison, the supernova in 1987 (SN 1987A) resulted in 25 neutrino events captured across three detectors. Information from a supernova can be used to learn more about neutrinos, such as how they change over long distances and setting limits on how massive they can be. They can also be used to learn more about the life cycle of stars and the formation of neutron stars and black holes.